Before we start discussing which Pokémon are useful and worth the Stardust investment, we need to think about what makes a Pokémon strong. In addition to these base stats, which are equal within one species, every Pokémon has individual values (IVs), that are added to the base stats. IVs for wild Pokémon range from 0-15, and from 10-15 for Pokémon hatched from eggs or caught after raid battles. Wild Pokémon therefore have an average of 50 % perfect IVs, while hatched Pokémon and raid bosses have an average of 84 % IVs. (combat power multiplier) is a constant that depends on the Pokémon’s level (details). Typical values for good Pokémon for attack, defense and stamina are around 150-200, so IVs add up to 10 % of the base stats. Since IVs can have a significant impact on a Pokémon’s strength, it is worth checking them if one wishes to identify the strongest Pokémon. Outside of the game there are several websites and apps that use the given information on the Pokémon screen to estimate the IVs. The game itself has the appraisal feature which provides a rough estimation of the IV range. A combination of ingame function and IV app usually leads to precise results. Before using external apps or websites I personally prefer to use the in-game appraisal function to pre-filter the caught Pokémon, transferring every Pokémon below 80 % IVs. I do however make some exceptions for Pokémon with a high level, a high attack IV (13-15) and a useful evolution that can be effectively used to battle without the investment of Stardust (i.e. high Eevee, Machop, Exeggcute, …). 37 – 45 Overall, your Pokémon looks like it can really battle with the best of them! Overall, your Pokémon is a wonder! What a breathtaking Pokemon! Overall, your Pokémon simply amazes me. It can accomplish anything! 30 – 36 Overall, your Pokémon is really strong! Overall, your Pokémon has certainly caught my attention. Overall, your Pokémon is a strong Pokemon. You should be proud! 0 – 22 Overall, your Pokémon has room for improvement as far as battling goes. Overall, your Pokémon is not likely to make much headway in battle. Overall, your Pokémon may not be great in battle, but I still like it! To make use of the appraisal function one must understand the Team leader’s messages first. They always rate the overall IV percentage first (see Table 13), followed by a rating of the Pokémon’s highest IV: attack, defense and/or stamina (see Table 14). They also rate the Pokémon’s size, which has no impact on the game to this point apart from a few specific medals in the Trainer screen. 15 Its stats are the best I’ve ever seen! No doubt about it! Its stats exceed my calculations. It’s incredible! I’m blown away by its stats. WOW! 13-14 Its stats are really strong! Impressive. I am certainly impressed by its stats, I must say. It’s got excellent stats! How exciting! 8-12 It’s definitely got some good stats. Definitely! Its stats are noticeably trending to the positive. Its stats indicate that in battle, it’ll get the job done. 0-7 Its stats are all right, but kinda basic, as far as I can see. Its stats are not out of the norm, in my opinion. Its stats don’t point to greatness in battle. It is worth noting that a Pokémon’s stats scale linear with the CPM, while the CP scales with CPM squared. The Pokémon’s damage output per second (DPS) therefore doesn’t scale linearly with its CP. The CP is not a measure for a Pokémon’s DPS, but rather a rough measure for its total damage output (TDO). How does a Pokémon’s battle ability improve with its level? 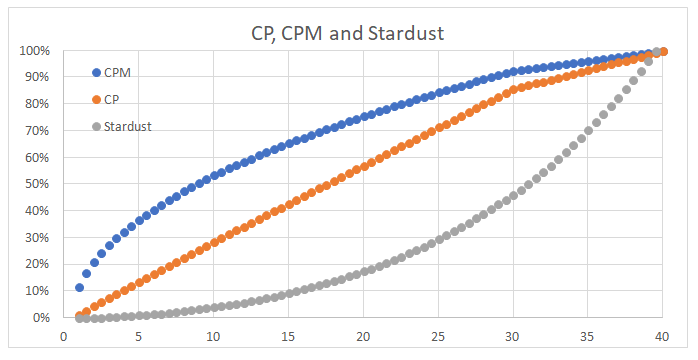 To answer that question one should look at the CPM, the CP and the required Stardust at every level, relative to its respective maximum value (see Figure 7). A Pokémon at level 20 (hatched Pokémon and raid bosses) has already reached 75 % of its max. stats and 57 % of its max. CP, while only requiring 17 % of the total Stardust cost if powered-up from level 1. A level 30 Pokémon has already reached 92 % of its max. stats and 85 % of its max. CP, while only requiring 46 % of the total Stardust cost if powered-up from level 1, or 30 % (75,000) if started at level 20. Powering up a Pokémon from level 30-40 requires twice the stardust as from 20-30, while only increasing the stats by 8 % and the CP by about 15 %. 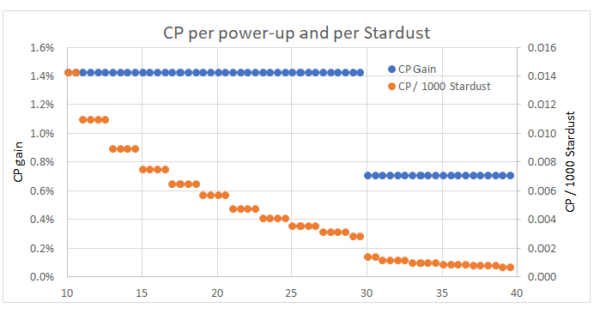 Stardust is the most limiting factor in the game, and one should therefore spend it carefully and efficiently, making sure to look at the CP gain relative to Stardust cost (see Figure 8). One can clearly see that the efficiency gains quickly decrease at higher levels. More precisely: it gets halved from level 20-29.5 and from level 29.5-30. Figure 9: Common power-up costs for different levels (source) and check out the creator’s site for more helpful graphics. To illustrate the influence of IVs we compare a wild Level 30 Dratini with 0 % IVs and a hatched level 20 Dratini with 100 % IVs. Both get evolved and the level 30 Dratini gets powered up to level 40 at a cost of 150,000 Stardust and 182 candies. If we now power-up the level 20 perfect IV Dragonite, we see that it already reaches the same stats at level 30 (Def, Sta) and level 32.5 (Atk) respectively, at the cost of only 103,000 Stardust and 92 candies. 1.3 What makes a good attacker? 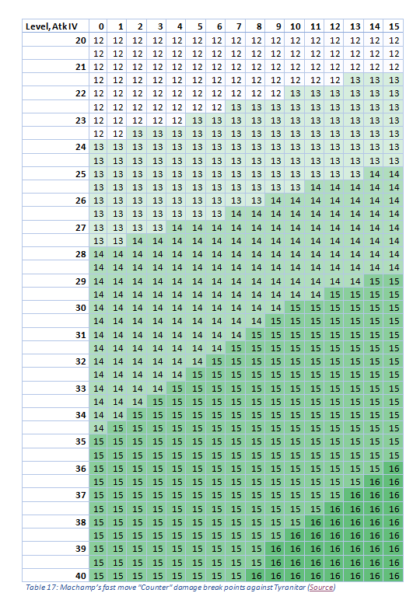 Type effectiveness: Every type has different resistances and weaknesses that get multiplied in case of a double typing (see Table 15 and Figure 10). So for example, using a Golem with rock type moves against a Moltres with fire type moves results in the Golem taking around 30 % less damage and the Moltres taking almost double the damage, when comparing the Golem to a “neutral” attacker. Hence one should try to get attackers with attacks of the same type (that ideally match the attackers Pokémon type) to better exploit the opponent’s weakness. The best way to find out what attackers are best against every Pokémon is by using simulation tools such as the Pokébattler (see Pokébattler Guide). Most Pokémon have a move pool of two fast and three charge moves, but they can only know one each at a time. One can change the Pokémon’s moves by using fast or charge TMs. Using a TM lets the Pokémon forget its current move and learn a random move out of its remaining fast or charge move pool. The difference between fast and charge moves is simple: Fast moves can be used all the time, deal damage and charge “energy”, while charge moves can only be used if enough energy has been saved up. The animation time is only relevant for defenders in terms of damage potential, because defenders have an additional delay of around 2 s that has a more negative impact on short moves with low damage per animation than on slow moves with more damage. For attackers the main impact of the animation time is when one is planning to dodge, which is much easier to do with quick moves. If we want to compare the effectiveness of fast moves, we should look at the damage per second (DPS) and the energy gain per second (EPS). 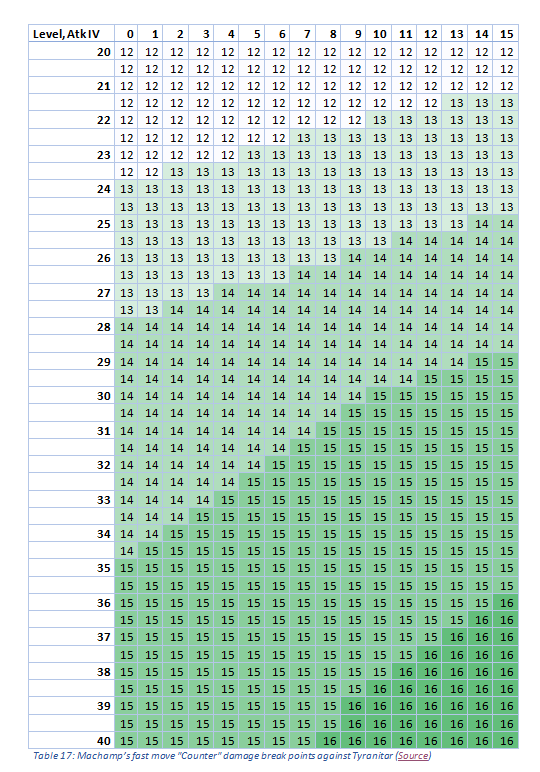 Usually fast moves have either high DPS or high EPS (example see Table 16). In the game one can only find the damage per animation, but most IV apps also show DPS, EPS and animation time for the Pokémon’s moves. Since the fast move’s performance also depends on the EPS, one should always also take the charge move into account, when comparing fast moves. The biggest difference between charge moves is the energy cost. There are moves with one charge bar (100 energy), 2 bars (50 energy each) and 3 bars (33 energy). All charge moves are superior to the fast moves in terms of DPS, so one should always use them to maximize damage output. That also means that a Pokémon’s DPS is significantly lower when it faints just before it is able to use a charge move (thus “wasting” the charge). To compare different combinations of fast and charge moves it is best to look at damage cycles. One calculates how many fast moves it takes to gain enough energy to use a charge move, adds up the damage of the fast moves and the charge move and then divides it by the whole cycle’s duration. The resulting DPS number takes the fast and charge move’s DPS, as well as the fast move’s EPS into account. Most DPS rankings one can find online and in IV apps for example include the Pokémon’s cycle DPS. The only thing DPS rankings don’t consider is the energy Pokémon gain when they take damage (0.5 energy per HP lost, Source). This is only included in simulation tools such as the Pokébattler. When comparing simulations to reality one also must consider “wasted” energy, i.e. when the Pokémon gets hit while the energy bar is full and the charge move hasn’t been used yet. Single bar moves are more likely to waste energy compared to multi bar moves since they can only be used with a full bar. So sometimes move sets that are superior in theory can perform worse in real battles due to these “wasted charges”. is the move’s damage, is the bonus factor for Pokémon using moves that match their type, and is the type-effectiveness factor (Source). One should note that every move deals at least 1 damage and that the result gets rounded down. This results in damage break points depending on the attackers Atk and the defenders Def values. The lower a move’s base damage is, the less break points it has. This means that the damage dealt for some moves against the same defender doesn’t increase for several power-ups, but when it “jumps” it often increases significantly (mostly around 10 % for fast moves). A very nice tool to calculate damage break points can be found here and the corresponding Reddit post here. The Gamepress guide on breakpoints can be found here. Table 17 shows the damage of Machmap’s (234 base attack) fast move “counter” against a Tyranitar raid boss (212 base defense) depending on the Machamp’s level and Atk IV. It is notable that the damage only jumps at levels 21.5, 25, 29 and 36 with perfect Atk IV. At level 29 Machamp already reached around 93% of its maximum damage potential. After level 36 only the damage for his charge move (e.g. dynamic punch) increases from 113 at level 36 to 117 at level 40. Since charge moves deal around 50% of the DPS it is roughly a 2% increase from level 36-40 at a cost of 72.000 Stardust and 98 candies. In some cases there are important defensive break points, e.g. a Gengar against a Mewtwo with the fast move “Confusion”. Assuming perfect Def IV, the Gengar can only survive long enough to be able to use its strong charge move “Shadow Ball” if it is level 32.5 and above.